Who is the mystery woman in this photo found in a second hand book in Market Harborough? Do you recognise the rather glamorous woman in the humdrum back yard setting in this black-and-white photograph? Is it someone you know, or a member of your family? The photograph was found tucked into a book bought at the Age UK book shop in Market Harborough, last year. It was bought by Glynis Deegan, from Leicester, who found the photo as she read the book. Now Glynis and husband Ron are hoping to re-unite the photograph with the original owner or perhaps her descendants. Ron told the Mail: “The photograph was obviously precious to someone. “As the book was bought in Market Harborough, it’s possible that this lady or her family live in the area. 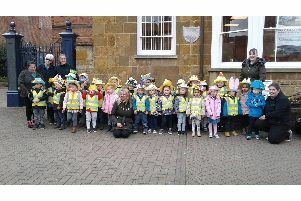 If you recognise the picture, or perhaps even the setting, please get in touch with the Harborough Mail. If the mystery woman is your relative, we will get the Deegans to forward the picture to you.